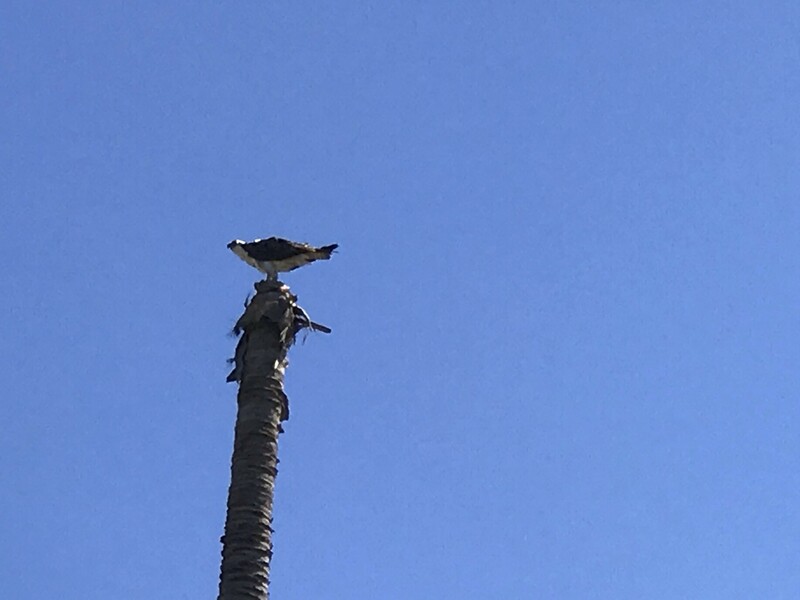 Today was filled with bird watching, wandering the town of San Jose del Cabo and eating popsicles followed by looking for humpback whales. Weather has improved in that we were in the 70s today. 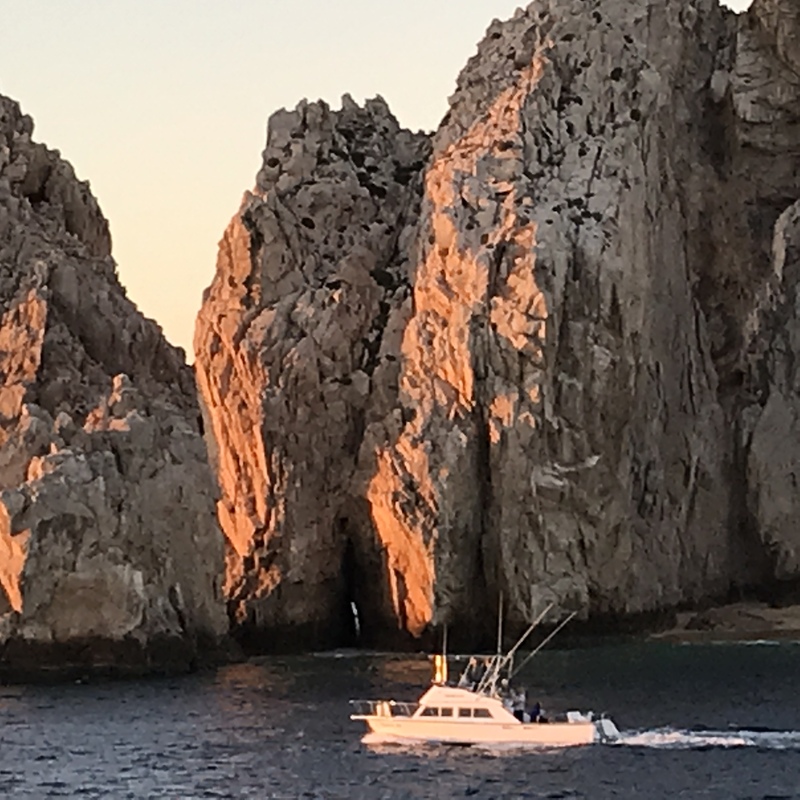 First day that has happened and that is on account that we arose to the sight of a sunrise in front of Friar’s Rock just off the shore of Cabo San Lucas. Every morning 700 fishing boats race toward the sea with fisher people, tourists, and heaven knows what else. We observed the armada at 6:30 a.m. from the deck of our ship and delighted in taking lots of pictures of the sunrise. No sleeping in on this adventure. The crew manages to keep us as busy as ants in an ant farm. 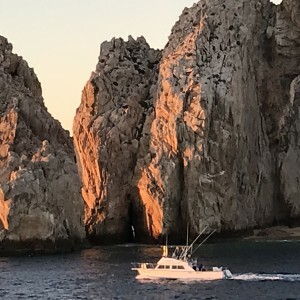 To visit San Jose del Cabo we had to sail north a bit and avoid Cabo San Lucas that has grown faster than a Ponzi scheme. 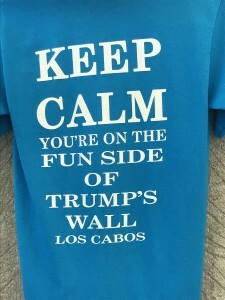 San Jose del Cabo is much quainter than it’s southern sister. Once we arrived near the port, we jumped into the zodiacs for a ride ashore and seas were calm so we arrived dry and ready to view birds of the area. 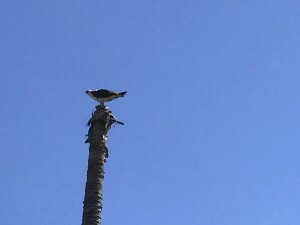 Most of the birds live in our neck of the woods but it was nevertheless fun and informative. Having finished our bird watching we took a shortcut from the estuary into town via a walk by the sewage treatment plant. Our guide informed us that the town had hired a British company to come and install the plant along with an agreement that they run the plant for 10 years. The manager likes to gross out all the visitors by drinking a glass of treated water. Lucky for us, they did not offer us a glass. And we didn’t get a tour. Instead we walked to the city zocolo (center) which sported the obligatory church, city hall, and the popsicle shop along with oodles of artsy, tartsy store fronts. The passionfruit popsicle was a winner. Having an hour to kill, we wandered the streets looking at the stores and this is when I snapped this pic. Hope you enjoy. Then it was back to ship and out to sea to watch for whales. Disappointment was no where to be found. There were plenty of whales. Spotted 5 flukes. Two breaches. And a partridge in a pear tree. Apparently as I was showering, one humpback took it upon itself to breach 5 times in succession. I only breached once in the privacy of cabin 207. 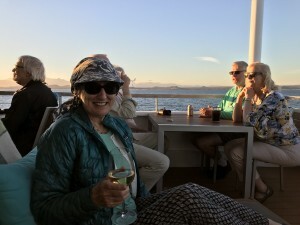 Given that the weather was near perfect, we all gathered on the stern for happy hour followed by a great dinner. Rayman with rays at his back on the stern. And lest you think I wasn’t onboard.. I chose a cauliflower “steak” with pesto and it was fabulous. As luck would have it, Rayman and I were sandwiched between two twosomes. On my left a mountain man looking person sat. His name was Albert. His wife across the table was Irene. Turns out they were mathematicians that haled from Harvard and MIT. And on my right, an internist and his friend was also a doc. Trying not to be a dim bulb, I spent most of my time talking to Albert and Irene. Rayman split his time in conversation with the two docs. A good time was had by all. 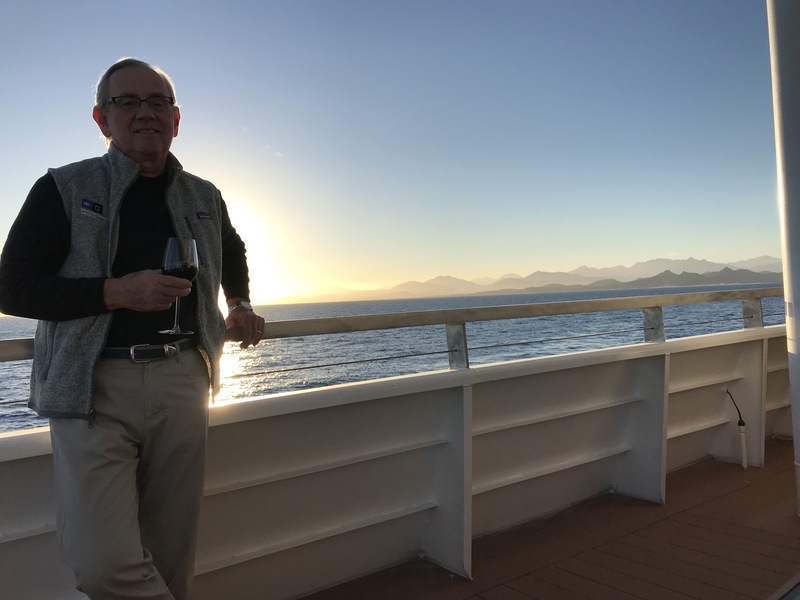 All this to say that there are a lot of very accomplished people on this cruise. The conversations at each meal have been interesting and entertaining. It leads me to the question, “What the hell am I doing here?” And then I remember, it’s my gift to myself for managing UR’s trust and I focus on enjoying every minute. So, here I am in bed. It’s 9:30, the ocean is being disrupted by the wake of the ship and it sounds great and somewhat hypnotic. The sea is relatively calm and all is right in the world. Tomorrow is another day in this fascinating Sea and I’m looking forward to it all. Some will swim with sea lions. We are passing on that one. And dinner on the beach of an uninhabited island followed by star gazing is on the plan. How they will herd a bunch of people onto the zodiac for a return trip to the ship in the dead of night (peeps that may have had too much to drink) is another matter and I may report on it extensively as it sounds like interesting things may happen. Just sayin. Your dinner companions sounded very interesting—not to mention accomplished. Reminds me of the time I was once, at our dinner table, chatting up a somewhat stuffy-looking British couple on a long-ago cruise. Learning that they were retired from an academic career, I asked about their current interests. Hearing that they now sell antique boats, I took off with that conversational gem and peppered them with questions about antique boats. 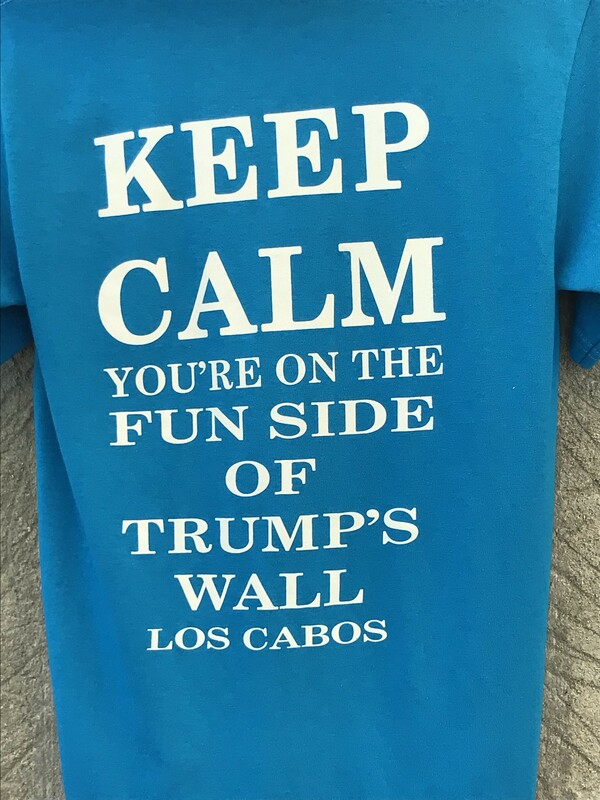 It seemed to me that they really knew very little about their new endeavor. The next night it somehow became known that their current interest was antique books. Big light bulb moment!! No wonder they could not really answer my antique boat questions! I confessed my misunderstanding, and they expressed great relief. They confessed that they had thought I was quite daft.